Trading ideas can be generated in a number of ways. Although a transaction is usually focused on a specific asset or sector, one can generalize a movement over time using statistical analysis. One of the best ways to attain an overview of where a specific security or sector will move is to use seasonality. Seasonal tendencies use statistical analysis to determine if a stock or index will move in a specific direction based on its performance in past situations. Although this might appear to be similar to pattern analysis that is used in technical analysis, it holds a statistical bias which is more convincing. When a security experiences regular changes which recur every year, it is said to have seasonable bias. Evaluating the seasonality of a security is often the first step I take in evaluating a potential trade. The next step is deciding on the best instrument to use to create the best risk adjusted returns. Here is an example of seasonal analysis and how it can be used to form the basis of a trade. The first quarter of 2016 has been volatile to say the least. U.S. equity bourses whipsawed and closed mixed after experiencing more than a 10% drop in prices mid-quarter. There are very few times in the history of the major indices that this scenario rung true, and it seems appropriate to analyze past April’s in an effort to see if this month shows strong seasonal returns. 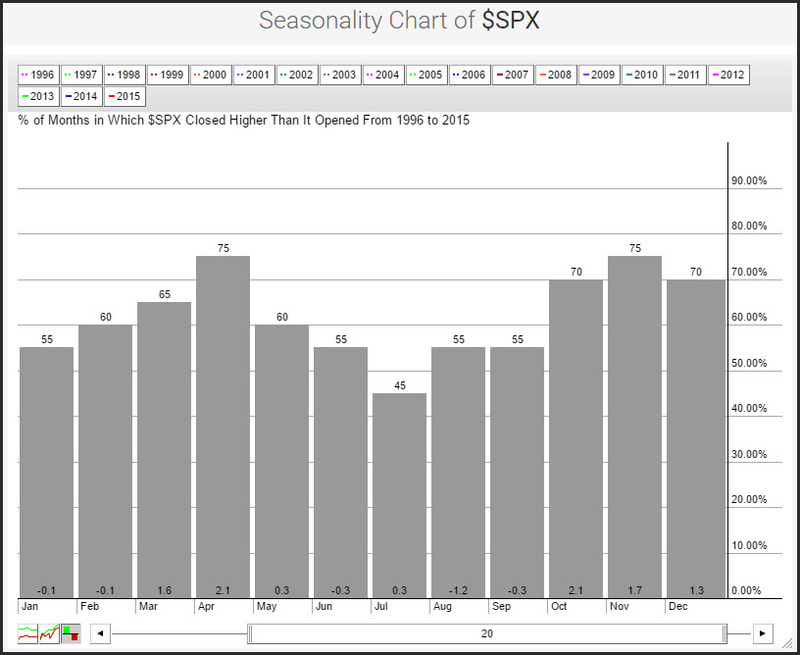 The chart above is a seasonality study of the S&P 500 index over the past 20-years. The analysis measures the performance of the S&P 500 index during each specific month of the year. The month over month returns is calculated for each month and then averaged over a 20-year period. This specific analysis shows that 75% of the April periods over the last 20-years average positive while 25% of those months are negative. The average return during April is 2.1% over the past 20-years. While there are other months that also show strong returns during the past 20-years such as November which is higher 75% of the time and October and December which are higher 70% of the time, the average monthly return during these specific months are not as robust as April. It is interest to note that this analysis covers the 2008 financial crisis and the ensuing stock market crash that occurred in 2009 and 2010. The 20-year period represents a long enough time frame that one can assume that these number are statistically significant. Also of note is the fact that during the past 10-years, which includes the financial crisis, April was higher 90% of the time with an average return of of 2.7%. Now while past performance is not indicative of future gains or losses, a seasonality study can provide a trader with a baseline of where the market might go and the potential sentiment that generally is experienced during that period.